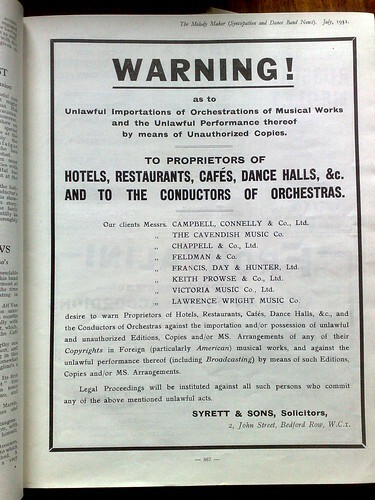 “You wouldn’t steal a car, you wouldn’t steal a baby” I spotted this while flicking through @kamintone‘s bound collection of The Melody Maker (Syncopation and Dance Band News) from 1931. Note it talks about “Unlawful importation” as well as performance – looks like even possession of copyrighted American arrangements would get you in trouble. 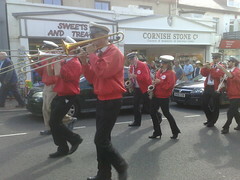 This is the parade band from Bank Holiday Monday in Bude. Marching up Belle Vue past the spot where I had been busking the day before. An interesting part of attending a small-ish festival in a small-ish town is the way that local people react. My experience of SXSWi in Austin – much bigger affair of course but probably proportionately so – was that I was surprised to find that lots of people weren’t even aware that the festival was going on. Not so in Bude, I suppose it helps when a band plays loudly around the main streets of the town, followed by ladies waving umbrellas. The point is, that the festival acts as a mediating point between people. It gives them something to connect about – that might not be positive. I didn’t hear anyone say this, but doubtless there are people muttering about the crazy jazz people and how they should keep the noise down. My personal experience was that it eased social interactions everywhere. Just carrying my uke around marked me as one of the crowd. Getting up and playing in the street – I busked both of the mornings that I was there – helped this enormously and for the first time, I found my presence not only tolerated but actually welcomed. The owner of “Sweets and Treats”, the shop you can see above wanted to know all about my ukulele and my playing. He sent his daughter out with bottled water to keep me going and chucked a few quid in the pot himself as well as encouraging me to come and play closer to his shop when I set up a little further down the road on the second day. I don’t know what was going on in the shop while I was playing, but I imagine that I became a social object to help smooth things between him and his customers, a talking point, a beginning of conversation, no matter how irrelevant to the actual sale of beachballs and suncream – the fact that I was there and could not be ignored was enough to make things easier for him. And I imagine that the whole festival works like this too. Especially when a parade is going through, people can agree to love it, agree to hate it, or disagree completely, but at least they connect, rather then just walking along in their own little worlds.